> Food price crisis: don’t forget the urban poor! The Global Forum on Agricultural Research (GFAR) has launched a series of Global Conferences on Agricultural Research for Development (GCARDs). The conferences, to be held every two years, are intended to stimulate an open and inclusive consultation process and thereby contribute to the development of a new global agricultural research system oriented towards tangible development outcomes. In particular, the GCARD process aims to ensure alignment of the research agenda with the development needs of the resource-poor; advocate more effective financial support; facilitate dialogue between different stakeholders on the way to innovation; and promote the integration of international agricultural research systems with national systems. The organisers of the GCARDs have made use of the possibilities offered by new information and communication technologies to reach as many interested stakeholders as possible in an open and efficient way. E-consultations, blogs, updates of documents, comments, Twitter, YouTube videos, and many other features are part of this innovative and attractive process. Regional reviews, completed in July 2009, supplied a summary of regional research and development needs within the global context of agricultural research. They were used to frame questions for subsequent e-consultations. Regional e-consultations and regional face-to-face (F2F) dialogues provide perspectives on priorities in agricultural research for development and on how research may be able to create more development impact. The first round of e-consultations took place from August to October 2009 and saw the involvement of over 1500 people from more than 200 countries and different stakeholder groups, such as national agricultural research centres and regional fora (30%), international agricultural research centres (29%), civil society and farmers’ organisations (17%), the private sector (5%), governments and donors (13%), and others (6%). The main areas of interest highlighted were 1) the need for agricultural research results to reach the poor, 2) farmer-centred research, 3) the role of youth and women, and 4) holistic approaches. Different key themes were raised in each region. Although the first round of e-consultations has ended, interested persons are encouraged to register in order to receive updates about the GCARD process and have the opportunity to participate in the next rounds of consultations. 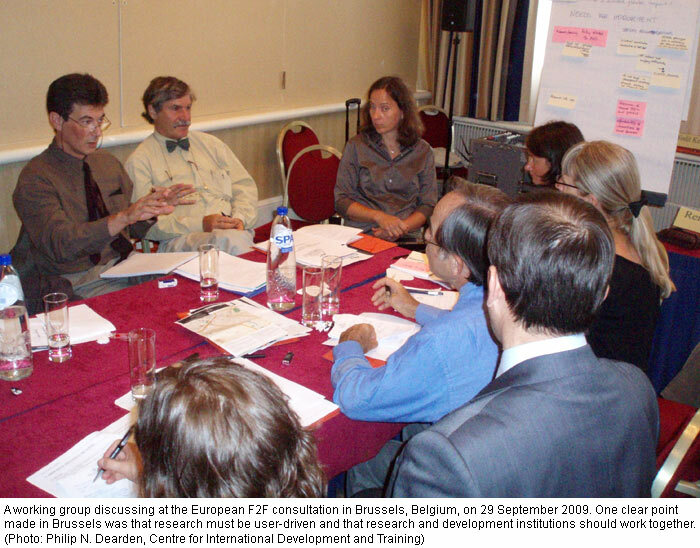 Regional F2F dialogues were held until mid-November 2009. The results of all the reviews, e-consultations and F2F workshops can be followed and commented on at the GCARD website. The first GCARD conference will be held on 28–31 March 2010, in Montpellier, France. The main contents and the list of participants are being determined in a participatory process. A pre-registration session is open on the website. The policies, principles and practices agreed upon during the process will be further developed after the conference into extended cycles of learning and feedback over the following years. In addition, the GCARD process is providing bottom-up inputs regarding the ongoing reform process of the Consultative Group on International Agricultural Research (CGIAR). In the era of electronic communication and exchange, the hope is that the GCARD process will achieve its goal: a new global agricultural research system oriented towards concrete outcomes for poor farmers. Food price crisis: don’t forget the urban poor! The last food price crisis of 2007 and 2008 attracted a lot of attention among policy-makers. However, although the vulnerability of the urban population facing this crisis has been acknowledged, policy recommendations mainly focus on assistance to rural populations. Statistics show that food insecurity is higher in urban than in rural areas. Moreover, although food may be available on the markets, this does not necessarily mean that it is affordable for the urban poor. While they may have higher incomes than rural dwellers, they also have to purchase more goods and services and lack the possibility to grow their own food. The authors explain the different circumstances related to food insecurity in rural and urban areas, highlighting the impacts that may be expected from the given situation. Their policy recommendations for reducing urban vulnerability to food price crises focus on three goals: preservation of incomes, moderation of price increases, and strengthening of coping mechanisms. The proposed measures include temporary social protection programmes, development of appropriate monitoring and information systems, and further research in order to understand the nature of employment and labour markets in urban areas of developing countries. Natural resource management and governance of land determine access to, and control of, assets that play a key role in rural livelihoods and often in power relations, as well. Pressure on land and natural resources is increasing due to population growth, depletion of resources, poor land potential, and climate change. This leads to competing claims. The emergence of local governments in rural areas is changing the institutions that influence access, control and management. This, in turn, is altering the way natural resources are used. The Royal Tropical Institute (KIT) in the Netherlands has published a new dossier on natural resource management and land tenure in order to sharpen the focus on these issues. A specific section of the dossier contains detailed information about natural resource management and land tenure in the context of decentralisation and governance. The publication also offers useful links to relevant articles, books and websites, with a regional focus on the countries of West Africa and the Sahel. Two workshops on forests, landscapes and governance were held in late 2008, one in Bhutan and one in Switzerland. Conceived by the Swiss working group on “Trees and Forests in Development Cooperation” and supported by the Swiss Agency for Development and Cooperation (SDC), the workshops were intended to bring together practitioners working in forestry and governance around the world. A recent publication synthesises the results of both workshops, in which participants explored the political, social and economic dimensions of decisions over resource management, as well as the different roles of and relations between governments, civil society and private sector actors. In providing a comprehensive overview of key issues, the publication argues that good governance of forests is more crucial for their sustainable management than technical inputs. Examples are provided from the Andes, the Congo Basin, Guatemala, Kyrgyzstan, Pakistan, Switzerland, and Vietnam. According to one workshop participant, “the workshops captured cutting-edge governance problems, particularly those related to participation and decentralisation”. How to document violations of the rights to adequate food and housing, water, land and territory that are related to monocultures for industrial agricultural production? Industrial agriculture, and especially monocultures, have had severe impacts on the environment and on people all over the world, particularly in developing nations with poor regulatory frameworks. A guide published by Fighting Hunger with Human Rights (FIAN) and the Habitat International Coalition (HIC) Latin America in June 2009 presents an analysis of the most prominent problems related to industrial agricultural production in monocultures – including forest plantations – from a human rights perspective. The guide provides tools for mapping, identifying and documenting human rights violations. These tools are intended for use by the communities affected by human rights violations related to monocultures, as well as their supporting organisations, and can be applied in support of advocacy strategies when bringing complaints to national and international human rights protection systems. The goal is to enable affected communities to claim their human rights. Focusing on the impacts that monocultures have especially on the poor rural population and on sustainable food production, the publication also intends to contribute to better monitoring of the effects of agrofuel expansion. Music and equity provide the soundtrack to the fair trade of African blackwood. The hardness and high oil content of Dalbergia melanoxylon, or mpingo as it is known in Tanzania, makes it highly prized among musical instrument makers, particularly for clarinets, oboes and bagpipes. However, this situation has induced the unsustainable harvesting of mpingo forests in Eastern and Southern Africa. The Mpingo Conservation Project (MCP) works with several communities in the forest regions of southeast Tanzania to help them obtain Forest Stewardship Council (FSC) certification. Meeting the FSC sustainable management criteria, though, is not as straightforward as it might seem. Calculating a sustainable felling quota is a complex undertaking: a forest inventory must be first carried out, followed by an estimation of the quantities of commercially useful timber, and finally markets need to be identified where customers can pay a higher price for this certified raw material. In addition, producing instrument-grade mpingo requires skilful work. Involved communities look forward to improvements of their quality of life thanks to the re-investment of profits from this programme into other local development projects. It is hoped that from now on provision of sustainably sourced African blackwood will be in the position to meet the demand of the market. Geographical Information Systems (GIS) capture, manage, analyse and display all forms of geographically referenced information. This information can then be visualised in different ways – for example in maps, reports or charts – and provide insights into relations, patterns and trends. In development cooperation, GIS is therefore a valuable tool for various types of activities, such as construction of settlements, development of water resources, and management of conflicts. 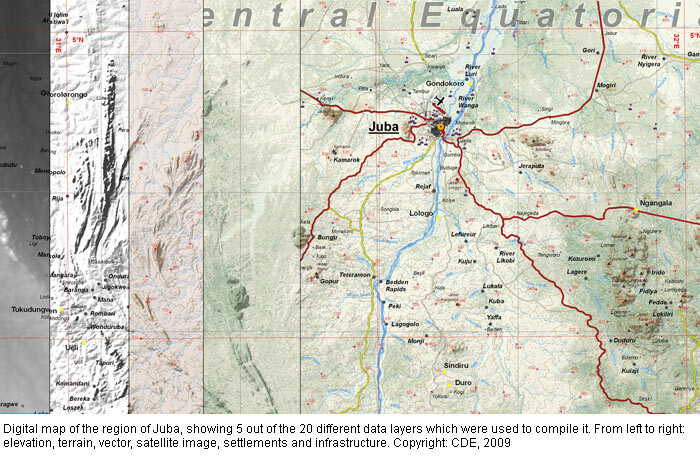 Aware of this, the Swiss Agency for Development and Cooperation (SDC), jointly with various other institutions, mandated the Centre for Development and Environment (CDE) in 2002 to support capacity development in geoinformation management in Sudan. Activities began with the provision of databases and maps, and later gradually shifted to reconstruction activities such as infrastructure rehabilitation and the provision of geoinformation services with a focus on capacity development. Main users have been the national authorities, UN Agencies, and international NGOs. A new website now makes the experience and information gained during the past eight years available to a broader public. The website also provides access to referenced and partly validated geodata, web-mapping applications, reports, and various types of maps. Based on detailed models, researchers of the International Food Policy Research Institute (IFPRI) have for the first time quantified the impacts of climate change on agriculture and food security. Although the results differ depending on the scenario, the trend is clear: without countermeasures, in 2050 yields will be lower than today. In developing countries the decrease will be clearly more marked than in industrialised countries. The highest losses are to be expected for irrigated cultures in South Asia. Climate change will also lead to a noticeably accelerated increase in food prices; wheat prices, for example, may double by 2050 due to climate change. Over the same time frame, per capita calorie availability will diminish. The problem of child undernutrition will become worse again. The authors argue that in order to prevent this grim outlook from materialising, investments are required both in development, in general, and in enhancing agricultural productivity, in particular. Moreover, policy-makers must give greater priority to adaptation to climate change. In concrete terms, the authors demand improved global data collection and investments of USD 7 billion annually in agricultural research, rural infrastructure and irrigation. In the globalised and digitalised world, where we have evolved since the end of the 1990s, the retrieval of relevant and concise information from reliable sources has not become easier but much more difficult. Furthermore, it has become more and more obvious that environmental themes such as forestry, agriculture and natural resource management must be considered in an integrated manner, combined with social and economic issues. InfoResources was created in 2003 with the aim of supporting development professionals, above all, but also the interested public in general, in finding reliable information on these themes. InfoResources was a joint service provided by three information and documentation centres working in the area of development and natural resources. In the course of 2008, InfoResources was joined by partners from the South: SIMAS in Nicaragua, CETRAD in Kenya, and Intercooperation delegation offices in the Andes, Bangladesh, India, and Mali. InfoResources News, to keep our readers updated on the latest developments and debates in our fields of expertise. InfoResources Focus, to provide overviews of relevant ongoing debates from different perspectives, accompanied by a commented bibliography. InfoResources Trends, a compilation of personal assessments of predicted changes by experts from the realms of politics and science, as well as from development institutions around the world. Furthermore, our Question and Answer Service has been at the disposal of our audience for the provision of information on specific topics. Exchange of valuable knowledge and opinions regarding the various aspects of development in natural resources, exciting discussions with experts and partners from the South, and quite a few moments of working under pressure to provide our services on time and in high quality: this was InfoResources for us. Now circumstances have led to the termination of InfoResources activities by the end of 2009. Wishing to find out whether our services have been of use and whether they are still needed, we asked our readers to give us their opinion. The following graphs show that the InfoResources services were mainly used for study purposes and to support project work in the field. They also indicate that the majority of users think it will be difficult to find the information provided by InfoResources publications elsewhere. Many thanks for your support and interest! 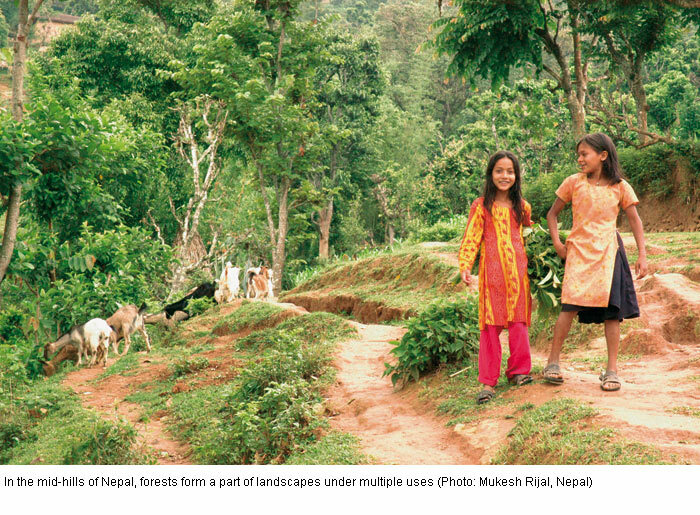 Rural Development through Public-Private Partnerships (PPP)? Global Agriculture: How much liberalisation is needed?